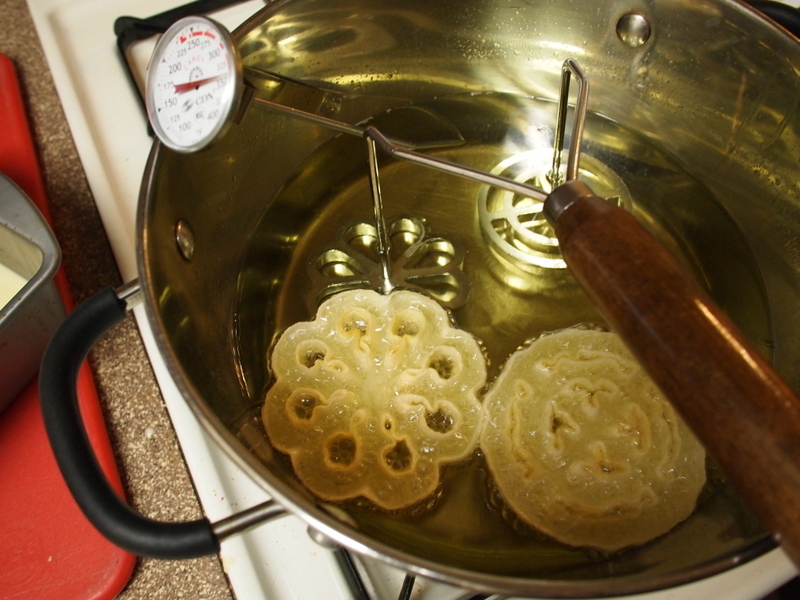 Rosettes are delicate Scandinavian fried cookies often prepared for the holidays. They are typically made with a simple funnel cake-like batter that has eggs and milk, so we crafted this vegan version that tastes just as good and has the added benefit of making more well-defined rosettes. To make rosettes you’ll need a special tool called a Rosette Iron. We used this Norpro Rosette Iron and found it to work quite well, though we’ve heard old-school cast iron ones work better than aluminum. Soak flax seeds in water for about 10 minutes. Combine in a blender with soy milk and lemon juice until smooth. Pour the liquid ingredients into a large bowl and set aside. Combine sugar and fennel seed (if using) together in a medium bowl. Stir in baking powder and flour. Whisk dry ingredients into the wet ingredients 1/2 cup at a time to make the batter. Cover and refrigerate for at least an hour. Move the batter to a heat-resistant, shallow dish (a bread loaf pan works well). To make the cookies, heat three to four inches of oil in a large stock pot to 350-360 degrees Fahrenheit — this is the ideal temperature range for frying these, so we suggest using a candy thermometer to monitor and adjust the heat throughout the cookie making. Place the rosette molds into the oil while it heats. When the oil reaches 350 degrees remove the molds from the oil, taking a few seconds to allow excess oil to drip off, then place the hot molds in the batter, being careful not to let the batter come up over the molds. Quickly move the batter-covered molds to the hot oil. As the cookies fry, they will slip off the molds. If they stick, you can carefully tap the handle of your mold on the side of the frying pot to enourage the cookies to drop off from the molds. When the cookies have browned, use the tongs to remove them from the oil, carefully shaking off excess oil, then place them on a paper towel to cool. While they are still a bit warm, dust the warm cookies with powdered sugar or colored sugar crystals. Continue frying cookies until all the batter is used. Store completely dried cookies in an airtight container. 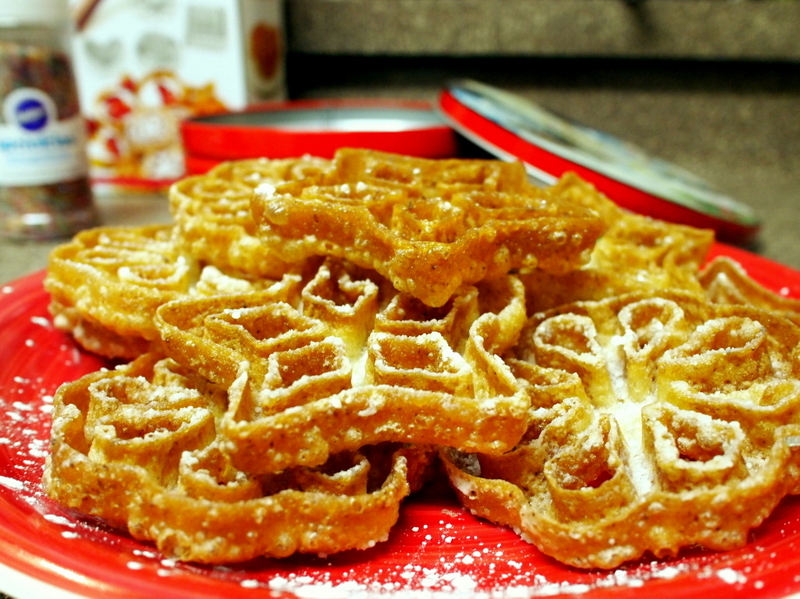 This recipe makes about two dozen delicious rosettes.